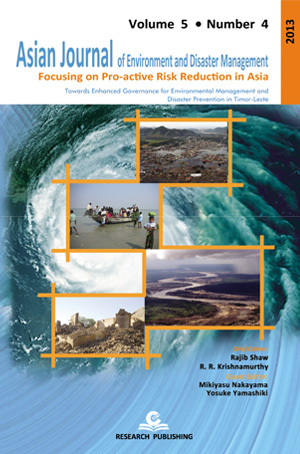 This is the first journal focusing on the environment and disaster related issues in the Asian region. Asia, being the center of urban growth in the last few decades, has also created severe environmental problems, and is prone to different types of natural disasters. This journal provides a forum to communicate research findings, not only through academic research, but also incorporating field based action research. Goal: Theory of environment and disaster management is complex, and it becomes even challenging when it is linked to field practice. There often observed a gap between the theory and practice in the field of environment and disaster management. The goal of this journal is to establish academic linkages of field practices with specific emphasis on environment and disaster management in the Asian context. The journal will have wider authors and readers, which will include the research and academic community, non-government organizations, policy makers and international organizations. Thus, the journal encourages the field practitioners and managers to share their thoughts and experiences and to interact with the academic community so as to fill the gap of research, education and implementation. The topics will cover wider spectrum of environment and disaster risk reduction and management. © 2012 Research Publishing Services. All Rights Reserved.